adding my own spin to share on their blog, Delish Dish. 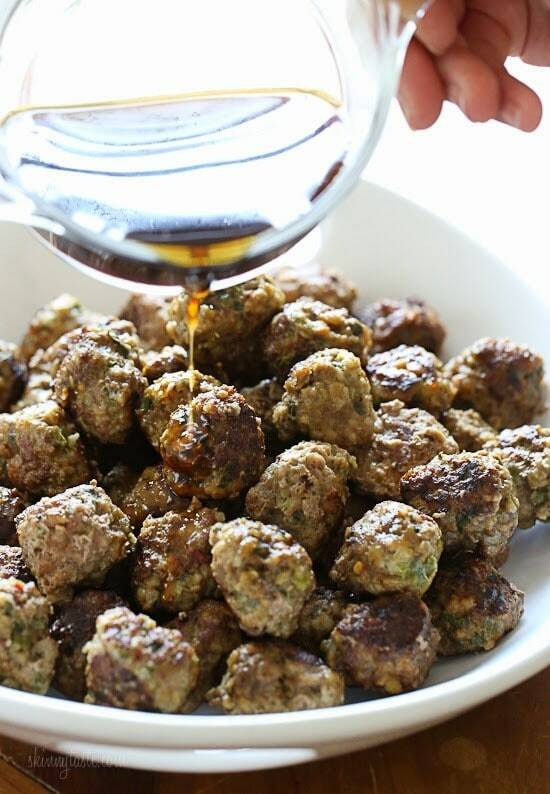 I was intrigued by these meatballs since the superbowl is around the corner! The orginal sauce used molasses, but honey was all I had and it worked out great. This makes about 60 mini meatballs. Click here for the complete recipe on Delish Dish. Why did you change the way you print from your blog? I hate wasting the trees I now have to in order to print the whole thing. For gluten free, can I substitute low sodium tamari (a little less, due to the stronger flavor), and GF bread crumbs for the oats? We’re avoiding obvious forms of gluten, not worrying about a small amount in condiments like Worcestershire sauce. Yes that should work. Let me know how they come out if you try them! Can’t wait to make these! I have all the ingredients on hand except for the rolled oats? Can I blend my quick cooking oats into a fine texture and use those instead? Thanks! I want to make these and freeze some. At what point would I need to freeze them? Uncooked and before initially going in the skillet? Cooked and after they've come out of the slow cooker?? Do you happen to have the Smart Points for this recipe? Would these still taste good with 2lbs beef instead of beef + sausage? I made these on Monday and they were so good! That sauce is delicious. I made half a batch and served them with zucchini noodles, with extra sauce over the zoodles (I built the sauce in the recipe builder to accurately track these extra points – not bad points-wise). We added a small amount of sriracha for a little extra spicy kick. Fiance loved them, as did I. Thank you for sharing this! If you wanted to bake rather than cook in the skillet, what temperature would you recommend and for how long? Probably 350F 15 to 20 minutes since they are small. I would LOVE to see the directions but they appear to be MIA on both this site and the linked site. Gina, I would love to serve these over some kind of a rice noodle dish. Any ideas? Ooh, these sound good. Ever since I maple syrup/soy sauce glazed meatballs, I've been looking for different flavors for meatballs other than traditional marinara sauce, and honey lime sounds awesome. It just lightens the calorie count of the recipe without sacrificing taste or stick-together-ness. These look yummy! will have to try them soon! Where is the recipe for these meatballs? The BHG site does not have them. Please re-post on your site. I am confused by the directions. It says to put the browned meatballs in the slow cooker for 2 – 5 hours (depending on setting). Doesn't the slow cooker need liquid? It appears you add the sauce after they cook. PS I found the directions after following 2 links, not very convenient. this looks perfect for the big game! I'm very confused. When I click on the link to see the complete recipe, that site does not seem to have the directions? what am I missing? What's the purpose of the slow cooker? Couldn't you just cook the meatballs and pour the sauce over them? Absolutely, you can bake them or finish them in the skillet. It will all give you the same results. Can you use all beef? And if you'd like to make it as a main dish, what do you suggest you serve with it? I would love to make these, they look delish! Unfortunately the link does not give recipe directions, help! Mini meatballs are so cute. I think of breakfast when I think that you used some sausage and honey. They sound delicious. So where is your full recipe? All the links take you the BHG recipe. Are we supposed to use your ingredient list and their cooking instructions? . Something fresh and different than old, good bolognese! I'm from Sweden and meatballs is kind of our thing I guess, but they are often kept very traditional in flavourings. Sad but true. I think it's easy to forget to experiment with classic and traditional foods. This honey-lime sauce looks awesome and I would love to try it! That honey-lime sauce sounds amazing! I love that these finish cooking in the crock pot! That makes it so convenient to serve these at a party! Ironically gotta say I love meat ball recipes since they're so easy to veganize! I grew up having meatballs only with tomato sauces…I'm so glad there are more (absolutely delicious looking) ways of having meatballs!! These sound and look soooo good!